value –> the Date or Number to be formatted. format –> string to format. n –> Format as a Number. If you include a number after the n, then this will denote the number of decimal places. Now, this is pretty AWESOME. Lets say you need to display a value in multiple currencies and formatted for each currency. You also need a reference to kendo.core.js. This is pretty slick. You can format the currency based on a culture which comes in very handy in some business application where you might need to display multiple currencies on the same page. In a ClientTemplate on a column on a Grid so you could format one column for Swiss Franc then have another column for US Dollars. Allowing the user to pick a culture and dynamically update the formats of the numbers, dates, etc without reposting the page. 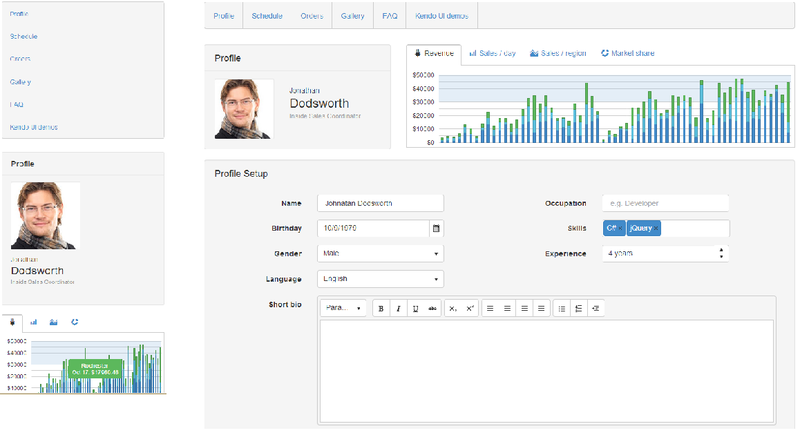 So you built this awesome business web app. You sold it to your customer and it’s now in production. You’re using SSL which is even configured for best practices. See my previous post on securing SSL. But what happens when a user goes to your web application. It probably redirects them to HTTPS so the user can login over SSL. Most interactions with your site is behind the login page. By most, I really mean like 99%. So in this scenario, there is no real reason to have HTTP bindings setup in IIS for your site. Turn port 80 off on the firewall and only allow Port 443. Don’t even give the hacker a chance to see the traffic over HTTP or an avenue to hack your server over port 80. But what about the customer??? They won’t know to use HTTPS… For me this is pretty easy answer. When sending the welcome package to your customer, explain to them why you did this and tell them the URL is only accessible over HTTPS. I have been doing this for years and yes we have had a few calls to the help desk. But VERY, VERY few calls. Security Assessment 101: What gives? 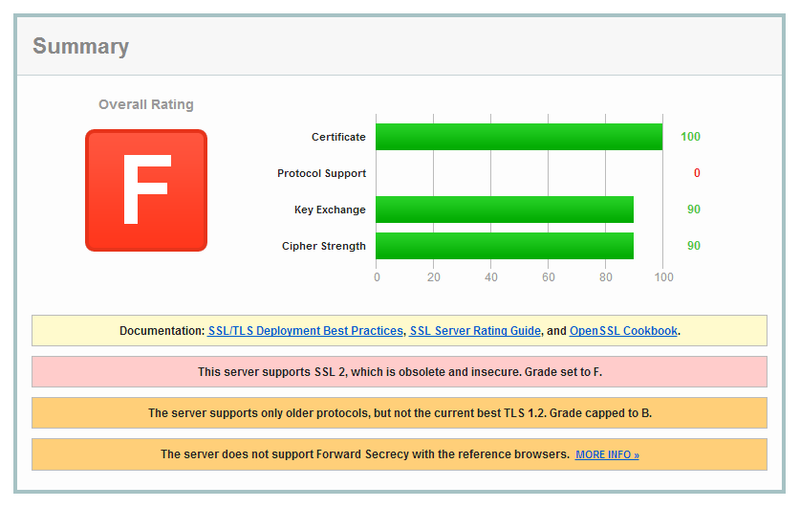 My SSL failed?!? You delivered your awesome business application and it’s running in production. You are a developer and have some limited System Admin skills so obviously your company decided you were the perfect person to set up your production environments. The data is sensitive so obviously you have SSL turned on. Everyone involved is in ecstatic!!! Then out of the blue, your customer calls to schedule a security assessment. First thought might be “I have SSL so that should be fine, but I’m nervous about my login page, XSS, CSRF, SQL Injection, etc.” News flash: SSL has vulnerabilities!!! And it is very easy for third-parties to identify those issues with your site during a security assessment. But even better, it is VERY easy for you to determine that your site has vulnerabilities so take the time to test your site (even if you are not the system admin) and fix it before your site goes live. This is to provide you guidance. You must do your own due diligence and validation by testing first in a non-production environment. Also, changing Cipher security in Windows Server may disable RDP so be very careful!!! This article is written based on Windows Server 2008 R2. I have not tested with Windows Server 2012 but am fairly certain it should apply. Which OS are you using in production? I highly recommend having at least Windows Server 2008 R2. If you only have Windows Server 2008 you will not be able to fix several items with your SSL. You will probably need to start a migration plan. The tool provided by Nartac modifies the registry so make sure you take the necessary precautions before using it. Check out sections on ciphers, forward secrecy and TLS support in web browsers. Well that is for you to decide based on your content and it’s sensitivity… I believe anything that requires an account (username and password), bank information, credit card information, personal information, … then you should be very concerned and take this seriously. If you want to be scared to death about using free WiFi at your local coffee shop or at the airport, then check out Troy Hunt’s site and read his articles about the “Pineapple“. That concerns me the most due to some of the sensitive info my applications have. Once your review your grade, there are additional details to review. Normally, my certificate is not an issue. So let’s jump ahead to the next section that is rather important: “Protocols”. This order is not good. It is the default out of the box for Windows Server 2008 R2. It is so easy to fix. More to come on that later. Next, you should review the “Handshake Simulation”. I only support IE so I only review those. You may support many browsers. You want the browser to support Forward Secrecy which is denoted with FS. You can see that none of the handshake simulation supports FS and some even support RC4 which is an issue too due to vulnerabilities discovered last year. Next, is to review the Protocol Details. This provides great information including links to read and review. In addition, your users may have TLS turned off by default or due to company policy. 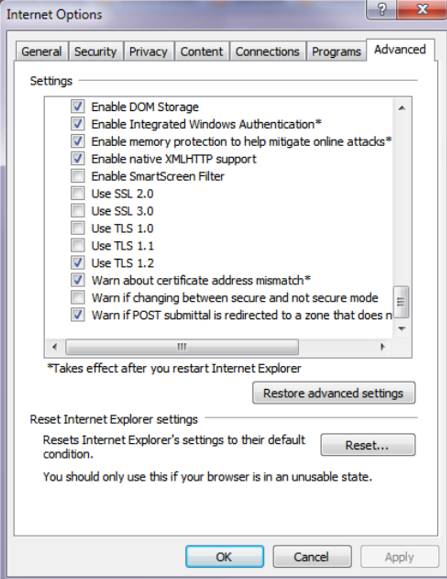 They will need to turn it on in IE under the Advanced tab for Internet Options; otherwise they will not be able to connect to your site. Luckily, fixing your SSL issues is very easy for Window Server 2008 R2. First start by downloading IISCrypto.exe from Nartac. After downloading, I ran my virus scanner against the file just to make sure there is nothing suspicious. You never know if that site was hacked. If you are wary about using this executable, you could write your own by following the Microsoft Support article. Take any backup precautions as you see fit. You will be changing the registry. Click the configure Best Practices button. Turn off SSL 3.0. The tool marks some registry keys incorrectly according to the Microsoft Support article. It uses 0x99999999 which may be fine but I update them anyway to reflect the values in the support article. Ensure that the DisabledByDefault key shows 0x00000000 (0) under the Data column (it should by default). If it doesn’t, right-click and select Modify and enter 0 as the Value data. Repeat step 8 for SSL 3.o. If you want SSL 3.0 turned off, then make sure the “Enabled” value is 0x00000000 (0); otherwise, it should be 1. 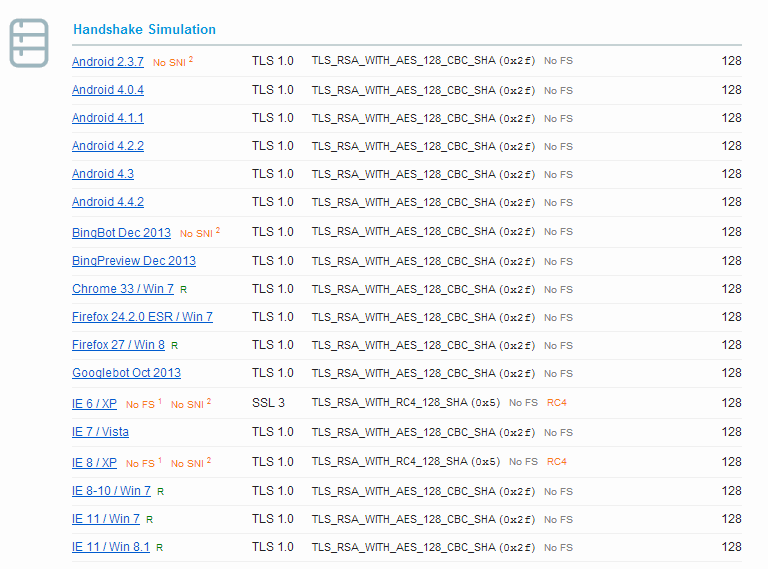 Then repeat for TLS 1.0, 1.1, and 1.2 making sure “Enabled” is set to 1. 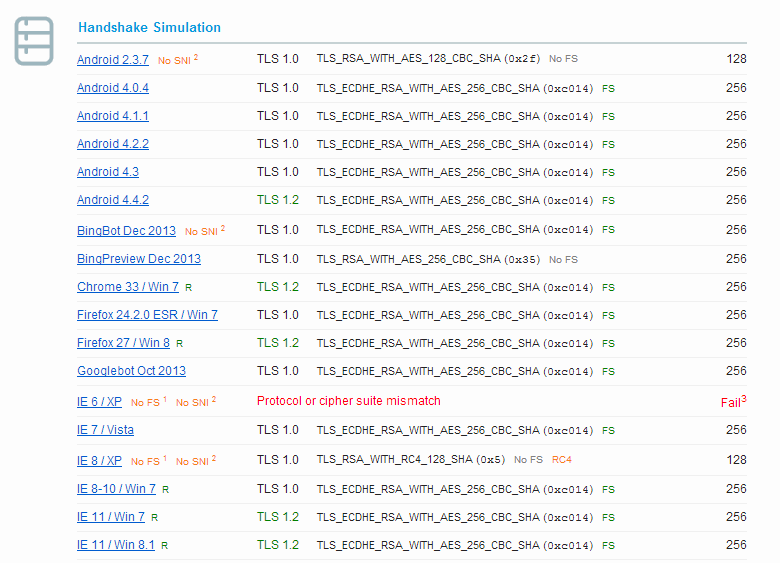 Now you can see that my production site only support TLS 1.0, 1.1 and 1.2. I have turned off SSL 2.0 and SSL 3.0. Notice the order that the Ciphers are in. Note: I keep the RC4 Cipher. From what I understand this is necessary for RDP. There may be a way to configure RDP to use a different Cipher but until I have time to figure that out, I am keeping this Cipher. In addition, notice how the FS (Forward Secrecy) ciphers are at the top. Remember, I am only concerned about IE 7 and above. We will be dropping support for IE 7 soon and IE 8 on XP. The rest of the handshakes for IE are using FS which is great! You may need to support multiple browsers so you will need to test accordingly. Finally, check out the Protocol Details. I hope this article helps those of you with limited System Admin skills. It took me a while to figure all of this out since my main occupation is Software Architect/Sr Developer… I am definitely not a System Admin but as a developer I do understand the importance of secure coding as well as following best practices on my production environments. There are many different aspects to tackling UI improvement and RWD. 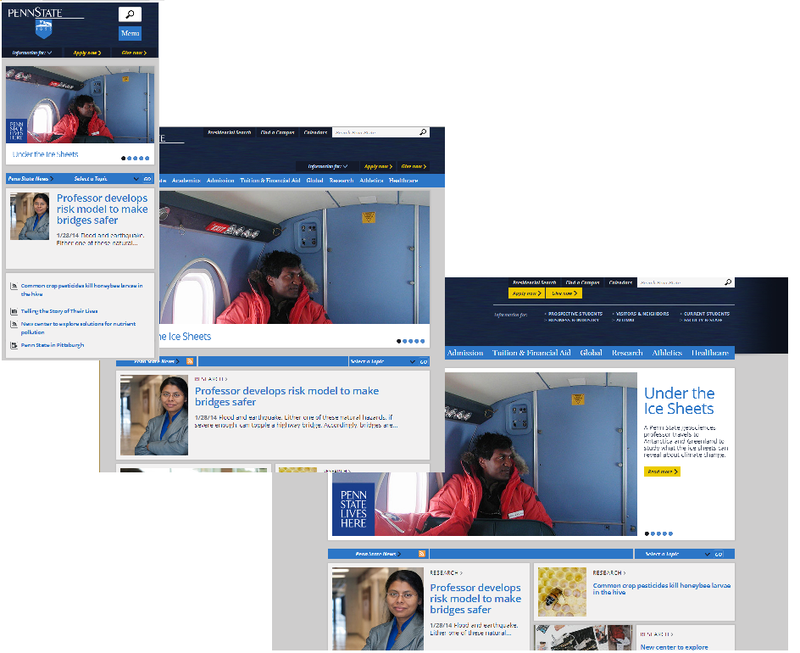 A lot of what I see on the web is about making web sites (IE. online stores, blogs, etc) responsive which is fine, but I live in the world of business web applications. Lots of data, lots of backend processing etc. Where to begin?!? Especially with so much legacy code… Right now, overall my company (like every other one) has been pushing for Mobile First. Well that is a GREAT strategy but not all aspects of my business application will be implemented on a smart phone. Main components of my application should be able to run on a iPad, Windows 8 Surface, Laptops with varying display sizes, and all the way up to desktops with large monitors. Depending on your scenario, one great benefit of business applications is that you can determine what browsers you support. Officially, we will be supporting IE, Chrome, and Firefox. I don’t have to worry about supporting all browsers since not all are approved or installed in a corporate environment. In addition, my applications should work on Safari but there is only so much time in the day and so much money in the budget so testing would be limited for that. If you have a PluralSight membership or a FrontEnd Masters membership, watch Ben Callahan’s video called “Responsive Web Design”. Lots and lots of hours of learning. All of these sites are responsive and as you resize the browser the content is resized, modified, and styled based on the screen size without having to refresh the page. Pretty awesome!!! Well you need to start with HTML5 and CSS3. Learn about Media Queries, ems versus pixels, transitions. Then, pick a framework. So many to choose from. Lots of good open source and lots of great third-party products. Since I write business application, I tend to concentrate on the core which is the business and customer needs instead of how to write a currency control or creating a grid from scratch or tweaking an open source project. Therefore, I bought a copy of Kendo UI. It gives me a lot of controls that adhere to RWD making my life a lot easier. Avoid inline styles at ALL costs. Depending on your scenario, avoid using the ViewPort and use media queries. Don’t forget — older versions of IE do not support media queries. Start styling for your smallest supported width first. In my case, that will be 1024px for an iPad in landscape. Later, certain portions of the application will be style specifically for smartphones. Use Percent on your widths instead of pixels or ems. When necessary, use ems instead of pixels. When necessary, use shims like Modernizer and or Polyfills. Hopefully you found this rather helpful to start understanding how to build your business apps using RWD. More to come soon on this topic. Found this HTML5 Element Flowchart by HTML 5 Doctor and wanted to share the link. I think it’ll come in very handy when making choices with HTML5. This chart has a basic flow chart for determining which HTML5 Element (<nav>, <article>, <section>, <aside>, <section>, <figure>, …) to use and when. Next, I think this tool written by Adnan Topal will come in handy for cleaning up HTML with inline styles, especially projects where developers did not follow best practices for styling, themes and using CSS style sheets. Over the last few years, I have become very focused on writing secure code. One of the main driving forces for this is the number of security assessments my application has undergone over the last few years as well as the plethora of information now easily accessible. So where does one start with writing secure code? More than likely you already have already started. But this is a question every developer needs to ask themselves and figure out how to keep up with the latest and greatest. Unless you have been living under a rock for the past decade, then you should already know who OWASP is. But since some still don’t know, OWASP stands for “Open Web Application Security Project”. Note: you cannot access the OWASP website over HTTP. First lesson about securing your web applications. Use HTTPS all the time! Every year OWASP puts out a Top 10 list. Troy Hunt is awesome! Who is he? Quoting from his web site, Troy Hunt is a “Software Architect and Microsoft MVP”. He writes about security concepts and process improvements for software delivery. Read it! It is a quick read and will enlighten you to so many topics on security. The book was written for ASP.NET Web Forms; however, it can easily be adopted to ASP.NET MVC. Some of my future topics will cover this. You can find fiddler at http://fiddler2.com/. Use it!!! All the time. Make it part of your process when checking in your code. It is very simple to do. The hardest part is making it a solid, consistent habit! Hope this info is helpful. More security article to follow very soon!! !